A good early-season River Nene barbel caught by Richard Lee. What a fantastic start to the new fishing season we have had. Those who continue to say the River Nene is now a shadow of its former self have had to eat their words as the river produced what has to go down as one of the best opening weekends we have known for many a year. An early first-day tench, one of seven taken from the Twenty Foot Drain by Geoff Rogers. The glorious 16th June was just that as reports came pouring in of big weights being recorded. At the top end of the river, Oundle produced several big tench weights, then moving down to Stibbington it was bream and skimmers being taken and an odd roach weight or two. Castor and Alwalton produced barbel and Orton upstream, a notoriously slow starter, fished unbelievably well with huge nets of bream taken both above and below the locks. And as if that was not enough the North Bank, so long neglected over the past few seasons, got off to a flying start with skimmers and bream being taken by those on the pole and feeder. Harry Murphy with a huge net of bream taken from the North Bank of the River Nene. Elsewhere the Fen drains fished reasonably well with both the Twenty Foot and Forty Foot producing tench and bream. All we can hope for now is that our local natural venues continue to fish well and gradually we will see more and more anglers returning to enjoy the quality fishing on offer. Unfortunately the bream in Ferry Meadows have not been so keen to feed. Peterborough & DAA winner John Means. In fact it’s been downright difficult to tempt more than the odd fish or two in recent weeks. 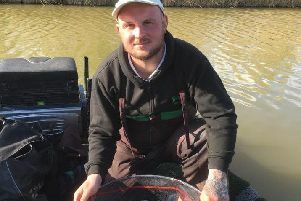 In the big Feedermasters Qualifier last Sunday, top rod on peg 94 was Greg Owen with a modest 26lb 11oz, then it was Phil Bardell with 24lb 6oz, followed by Steve Taylor on 23lb 6oz. Peterborough & DAA ran their first match of the season at Orton Upstream which saw venue expert John Means take the honours. He picked up the Gallyon Trophy with a net of skimmers and bream along with a bonus tench finishing with 22lb. He alternated between the pole and feeder from peg 14. At the other end of the match length was Steve Stones, who had a net of small fish taken on the pole for 8lb 6oz, then came Paul Dotchin with 7lb 4oz. First place in the Ramsey club match on the Ramsey St Mary’s section went to Deeping St James rod Brian Johnson. He caught from peg two fishing chopped worm and caster taking four bream and two good tench for 18lb 1oz. Close behind in second place on 17lb 10oz was Keith Rayment, who caught silvers on the whip and added a couple of better fish late on, on a long pole line. Third with 1lb 10oz was Ivan Steels. Yaxley, Farcet, Holme and District AC fished the Stokes No1 Cup at Monks Lode under a blazing sun and clear blue sky. Weather conditions like that are not always the best when drain fishing and sadly that was the case. Paul Marriott clinched top spot with 4lb 12oz and then came Mike Mohan with 2lb and Steve Cox with 1lb 7 oz.